Definition at line 39 of file llmessagetemplateparser_tut.cpp. Definition at line 40 of file llmessagetemplateparser_tut.cpp. Definition at line 44 of file llmessagetemplateparser_tut.cpp. 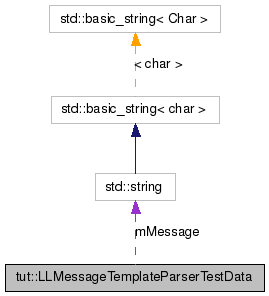 Definition at line 62 of file llmessagetemplateparser_tut.cpp. References tut::ensure_equals(), LLMessageTemplate::getBlock(), LLMessageBlock::mName, LLMessageTemplate::mName, LLMessageBlock::mNumber, LLMessageBlock::mTotalSize, LLMessageBlock::mType, NULL, and prehash(). Definition at line 48 of file llmessagetemplateparser_tut.cpp. References tut::ensure_equals(), LLTemplateTokenizer::line(), mMessage, and LLTemplateTokenizer::next(). Definition at line 78 of file llmessagetemplateparser_tut.cpp. References tut::ensure_equals(), LLMessageVariable::getName(), LLMessageVariable::getSize(), LLMessageVariable::getType(), LLMessageBlock::getVariable(), LLMessageBlock::mName, NULL, and prehash(). Definition at line 57 of file llmessagetemplateparser_tut.cpp. Referenced by ensure_block_attributes(), and ensure_variable_attributes(). Definition at line 94 of file llmessagetemplateparser_tut.cpp.